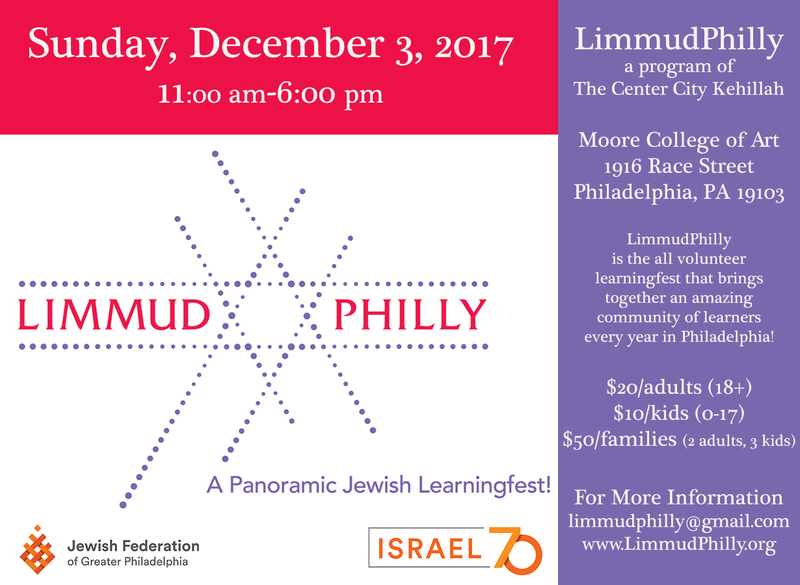 We’re so looking forward to learning together this coming Sunday, December 3 at LimmudPhilly. The event runs from 11:00 am-6:00 pm at Moore College of Art & Design at 20th and the Parkway and includes a kosher catered lunch. All are welcome for some or all of the day! The learning will provide something for everyone, from music and film to social justice, text study, Israeli dance, and more. For families with children, Young Limmud, for ages 3 and up, will provide the kids with their own fantastic Jewish learning experience while their parents can participate in the adult sessions. We’re also so happy that this year’s event is in partnership with Israel 70, and we’ll have a whole Israel track as well as a plenary featuring Christian clergy who have participated in the Jewish Community Relations Council’s interfaith trip to Israel. Click here to read more about the event from a wonderful feature written by Jewish Federtion, and click here for the schedule of the day’s sessions. We hope to see you there!